Check back for information on Beantown Camp 2016 sponsors. Get on the mailing list to get notified when further information for Beantown Camp 2016 is available. Beantown is honored to have awesome sponsors including some of the most amazing events as well as friends and supporters in our local and neighboring communities. We appreciate every one of them and hope you will too. Support our sponsors! 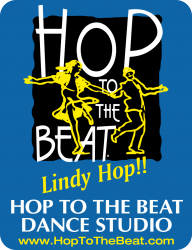 Tony and Aurelie established Hop to the Beat Dance Studio in 1995 and offered the first Lindy Hop classes in the Boston area. The original goal was to spread the joy of Lindy Hopping and that has not changed! What started as small Lindy Hop practices in the early days eventually grew into the popular monthly Uptown Swing dance in Brookline. Beantown Camp was started in 1997. Much has happened, evolved and been added over the years and HTTB celebrated its 21st anniversary last fall! Uptown Swing is a monthly Saturday dance hosted by Hop to the Beat at KI in Brookline. KI is a beautiful venue with the largest dance floor in New England. It is in a prime location, only a few blocks from Coolidge Corner. Live bands are featured each month for Lindy Hop, Swing, and Balboa. The atmosphere is fun and friendly and all levels are very welcome! The International Lindy Hop Championships (ILHC) will take place in Washington D.C. August 27-30, 2015. It’s the event’s mission to recognize the international presence and appeal of Lindy Hop, while preserving its spirit and giving the dance the respect and honor it deserves. Hundreds of “Jitterbugs” from around the world will come to dance with one another, throw each other around in the air, learn more about Lindy Hop, and compete in many different competitions for prize money and bragging rights. ILHC is sponsoring the Solo Jazz competition. The Lindy Hop, Balboa, Blues and Jazz Dance Camp and New Year’s Party, returning December 26th 2018 - January 1st 2019 in Asheville, NC USA. Lindy Focus is sponsoring the Strictly Lindy competition. The Canadian Swing Championships is an annual weekend of mayhem for all types of Swing dance! Lots more than a competition… If you have not been to CSC yet, don’t ask someone to explain it to you… you just have to live it! This year is the twelth anniversary! The Canadian Swing Championships is sponsoring the Advanced Mix & Match competition. Kind of a Big Deal is held each January and is hosted by Boston Swing Central. This weekend event include dances, workshops with international instructors and competitions. Kind of a Big Deal is sponsoring the Novice Mix & Match Lindy Hop competition. Inspiration Weekend is a Swing dance event in Fullerton, CA. It is held in March and features 3 nights and 2 days activities that include live music, competitions, performances, and workshops from some of the world’s best Lindy Hop instructors. Inspiration Weekend is sponsoring the Intermediate Mix & Match Lindy Hop competition. Midwest Lindy Fest is held in April in the Twin Cities, Minnesota. Three days of dance inspiration with classes and contests. Midwest Lindy Fest is sponsoring the Soul competition.